The term "overindulgence" is probably best assessed as a red flag, especially with respect to consistent overconsumption of high-calorie comfort food and desserts during the holiday season. An overall healthier perspective could be described as "indulgence" regarding such calorie intake. Provided that we have maintained healthy lifestyles, especially regarding exercise and nutrition, during the course of the year, indulging a bit during the holiday season will likely not have a negative impact on our long-term health. During the year, healthy nutrition is obtained by making sure to consume food from all four food groups on a daily basis: fruits, vegetables, grains, and protein. Dairy products represent an optional fifth food group. Consuming foods from all the major food groups provides a broad range of nutrients and a wide variety of phytochemicals. Phytochemicals are macromolecules that furnish protection against the development of many chronic diseases, including cancer, heart disease, stroke, high blood pressure, diabetes, and arthritis. Many phytochemicals act like antioxidants and neutralize free radicals in human cells. Others have anti-inflammatory properties and help slow the aging process. Fruits and vegetables rich in phytochemicals include carrots, blueberries, apples, greens such as kale and chard, broccoli, oranges, beets, rutabaga, tomatoes, and sweet potatoes. Importantly, healthy nutrition is fulfilled by eating at least five servings of fresh fruits and vegetables every day. Calorie consumption is also a critical factor in healthy eating.1 Consuming excess calories on a regular basis will result in these energy sources being stored primarily as fat. The best kinds of food are nutrient-dense, rather than being calorie-dense. Lean meat, fish, whole grains, high-quality dairy products, and fruits and vegetables are all nutrient-dense foods. For example, sprouted grain bread is nutrient-dense while white bread is calorie-dense. It takes a little effort to determine which foods are healthy and which are not, but once you've done your homework, it becomes easy to choose the foods that will provide valuable energy and nutrients to you and your family. As a side benefit, beginning a healthy nutrition food plan may result in weight loss and normalization of high cholesterol levels. In addition to consuming nutritious foods, a second key component of healthy living involves regular vigorous exercise five days a week for at least 30 minutes per session. Such exercises can include yoga, strength training, walking, running, cycling, and swimming. The specific choice of exercise is less important than the consistency. Regular vigorous exercise is strongly correlated with multiple health benefits, including enhancing cardiovascular health and strengthening the immune system. 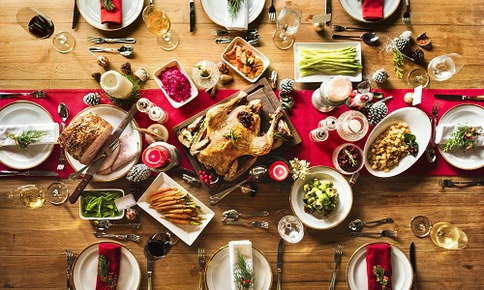 With healthy lifestyles in place over the long-term, holiday indulgence provided such indulgence is not excessive, represents a blip on the radar. With long-term habits of healthy nutrition and regular vigorous exercise, we and our families are able to tolerate minor deviations from our baseline without suffering ill consequences. In addition, including regular chiropractic care in our long-term healthy lifestyle plan adds the benefits of spinal health and a healthy nerve system, our body's master system, to assist in supporting our overall long-term health and well-being. Complete the form below to send us an email.